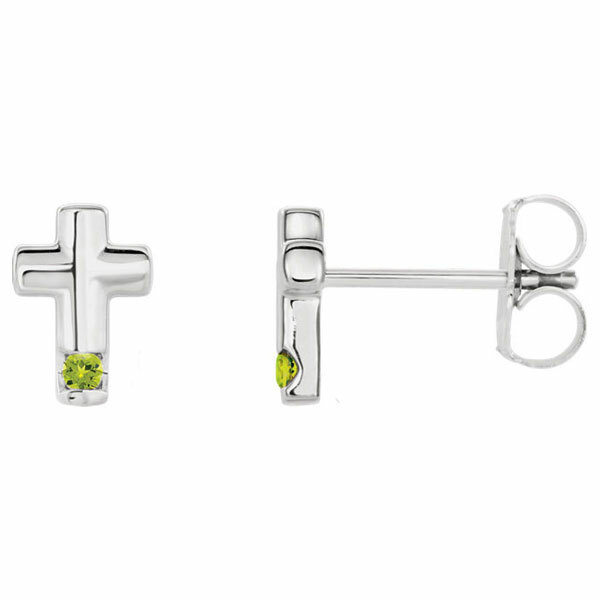 Pretty bright green peridot gemstones sparkle and shine in these peridot cross stud earrings in 14K white gold from Apples of Gold Jewelry. Genuine, bright green peridot stones are set into the bottom of these 14K white gold cross stud earrings, giving each a pop of color. The peridot stones are 1.5mm in size each and add such extra charm to the earrings. The rounded cross stud earrings, which feature friction post and back closures, each measure 7.29mm by 5mm in size (5/16" by 3/16"). "If we confess our sins, he is faithful and just to forgive us [our] sins, and to cleanse us from all unrighteousness" (1 John 1:9). We guarantee our Peridot Cross Stud Earrings in 14K White Gold to be high quality, authentic jewelry, as described above.